“Since therefore the children share in flesh and blood, he himself likewise partook of the same things, that through death he might destroy the one who has the power of death, that is, the devil, and deliver all those who through fear of death were subject to lifelong slavery” (Hebrews 2:14-15 ESV). Recently, I heard an Independent Fundamental Baptist preacher comment that he believes in salvation “by the blood of Christ, not his death.” One who heard this comment with me registered his shock at the statement. Having discussed this issue with this particular preacher in the past, I knew what he meant by it, and was able to fill in my companion. The following bullet points are a summary of the things I shared with him. Suffice it to say that there is a segment of Independent Baptist Fundamentalism that so wants to defend the “literal” interpretation of Scripture that it will often deny simple figures of speech in Scripture to the extent that it begins to distort the very fundamentals it intends to defend. One such fundamental of the faith that has suffered such distortion is that of the hypostatic union of Christ’s human and divine natures, of which the historic conciliar statement produced by the Council of Chalcedon (AD 451) expresses the Biblical doctrine quite thoroughly and has served the church well in defining the orthodox position. 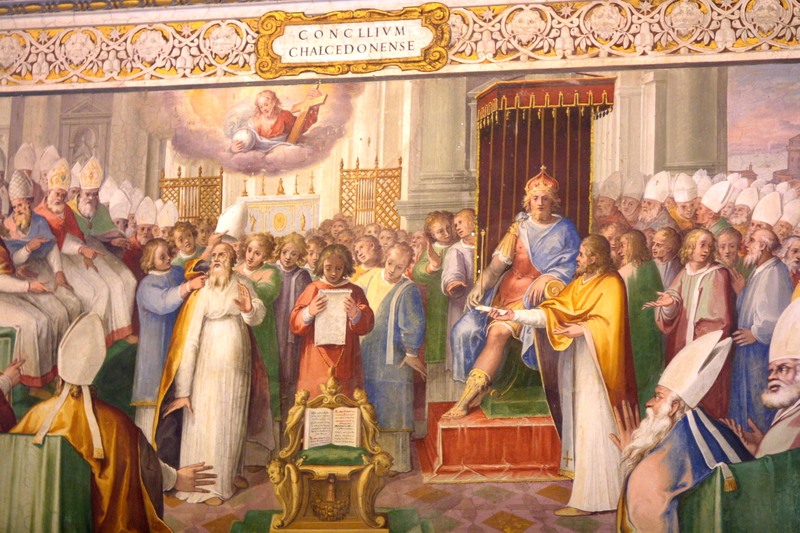 Although an appeal to the so-called “Definition of Chalcedon” as an expression of Scriptural teaching on the matter falls on deaf fundamentalist ears, it does not change the fact that, historically speaking, for the Protestant as well as the Roman Catholic, to dissent from this Ecumenical Council on the hypostatic union is to be led by blind guides into the ditch of formal heresy. Sad to say, this is the fate of the kind of irresponsible Biblicism that often goes on in the Fundamentalist movement. Divine Blood proponents believe a biological myth that the male seed provides the blood to the conceived egg (see this post). Divine Blood proponents believe in the seminal headship of Adam to the neglect of his federal headship. The Reformed affirm that seminal headship conveys actual moral corruption by means of “ordinary generation” (WCF 6.3), and that federal headship is the imputation of Adam’s guilt to all of his posterity (aka, “original sin”). Divine Blood proponents therefore conclude that sin itself is actually transmitted in human blood from Adam through the father to his offspring, and that therefore Christ was sinless primarily because he did not have a human father who would transmit his sin-tainted blood to him, thus making him a sinner. Divine Blood proponents misinterpret Heb 10:5 to teach that God the Father specially created an embryo and implanted it in Mary’s womb, so that Jesus was not the result of the supernatural fertilization of one of Mary’s eggs. This Christological error dates back to the radical reformation of the Anabaptist movement in a teaching called the “Celestial Flesh of Christ” (see this post). Divine Blood proponents believe that the references in Hebrews to a “greater and more perfect tabernacle” (Heb. 9:11-10:14) mean that Christ had to actually transport this divine blood shed on the cross into the presence of God after his resurrection, but before his appearance to the apostles, in a “literal” heavenly temple to pour it on a “literal” mercy seat. Little do they realize that Scripture elsewhere reveals Christ as the true Temple (see John 2:18-22; Heb. 10:20). Thus his sacrificial death, associated with and proclaimed as the fulfillment of the Old Testament sacrificial system by metonymous reference to his blood, is his offering of this ultimate sacrifice “once for all (time)” on the cross (Heb. 7:27; 9:12, 26; 10:10). His ascension and heavenly session actually serves as the anti-type to the references to the yearly repetition of the Aaronic priesthood which is contrasted with Christ’s sitting down at the right hand of the Father after making his ultimate once for all sacrifice (Heb. 10:11-14). Thus, Divine Blood proponents confuse the human and divine natures of Christ. If his blood isn’t ordinary human blood derived from a human conception, albeit overshadowed by the Holy Spirit, then his blood is less than fully human, a compromise of the historic orthodox interpretation of Scripture, which is exemplified by the Chalcedonian Definition. The confusion of Christ’s human and divine natures repeats the kind of mistake made by the monophysites of ancient church history. The “hypostatic union” of a completely human nature and a completely divine nature without confusing them or so separating them that they are no longer united in one person, Jesus of Nazareth, is the orthodox, biblical teaching on the God-Man. One should not define Christ’s human nature in terms of his divine attributes, nor define his divine nature in terms of his human attributes. To hold to a “celestial flesh” and “divine blood” view of Christ’s nature is just such an error. I found an excellent, but lengthy, treatment of this doctrine by an Irish Reformed minister. If you’ve ever heard of this doctrine before, and are the least bit concerned about it, please invest the time in reading “Fundamentalists and the ‘Incorruptible’ Blood of Christ” by Martyn McGeown of Covenant Protestant Reformed Church in Ballymena, North Ireland. Although it’s by an Irish writer, much of his essay interacts with American fundamentalist contributions to the controversy as well. Man this is weird stuff! It smacks more of the occult or of Romanism than of Christianity. Very true, in fact, the author of the lengthy expose to which I link points out such parallels with certain Romanist mystical errors about the “Blood” of Jesus. Thanks, John. I read your stuff, but not what you had linked to. I’ll check that out when I get a chance. Thanks to you, too, Andrew. And your site looks inviting as well.